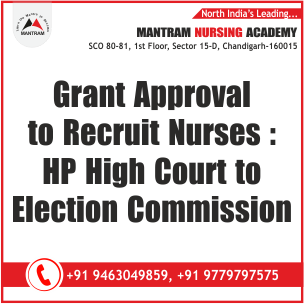 On 11th April 2019 the High Court of Himachal Pradesh directed the Election Commission to grant approval to the state government to recruit nurses in the state has come as a big relief to those eyeing career in nursing. The court has observed that that there was a colossal shortfall of nurses in the state. It may be recalled that the state government had imposed a blanket ban on the recruitment of nurse in the state pursuant to the imposition of Model Code of Conduct ahead of the Parliamentary election in the state. The news has brought in a sense of joy and jubilation for those who are eyeing career in nursing profession across the world. We, at Mantram, too, share this moment of momentous joy. Mantram Nursing Academy, situated in the heart of City Beautiful Chandigarh, extends its hearty welcome to all career seekers across the North India. Mantram, a star Nursing Academy in the country, which has emerged as a one-stop destination for the choosy career seekers. We are offering an expert nursing coaching for recruitment and for entrance exam (B.Sc. Nursing, Post Basic Nursing and M.Sc. Nursing) admission to some top-rung medical colleges/ institutes, across the country including AIIMS, IGMC/HPU, JIPMER, PGIMER (Chandigarh), BHU, et al. We also provide specialized coaching for NCLEX and OET exam. The outstanding feature of the Academy is that we have roped in a highly qualified and competent faculty with years of experience and expertise in the field.